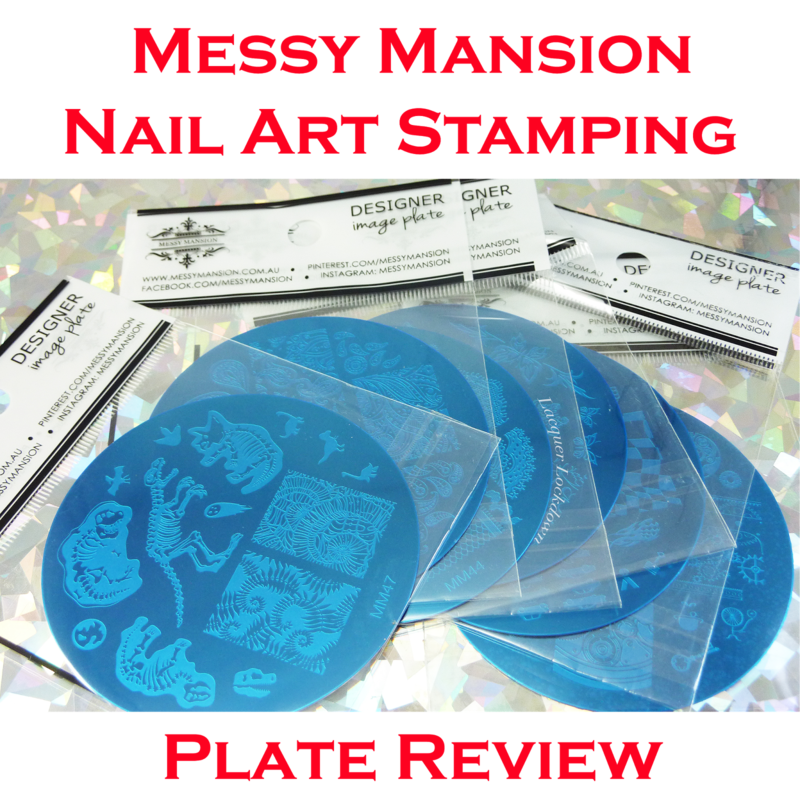 What can I say about Messy Mansion that hasn't been said about 1 million times already on this blog?This company was started by owner Julia McGowan a native Aussie nail art fanatic and enthusiast. Since the inception of this company she has been wowing our socks off along with her brilliant partner Lily Anne Viridae. I've experienced more than my fair share of plategasms stalking ahem I mean purchasing these plates ;) The MM series was the start of it all offering us images that met the demands of the longer nail gal crowd while also giving us fresh and innovative designs time and time again. 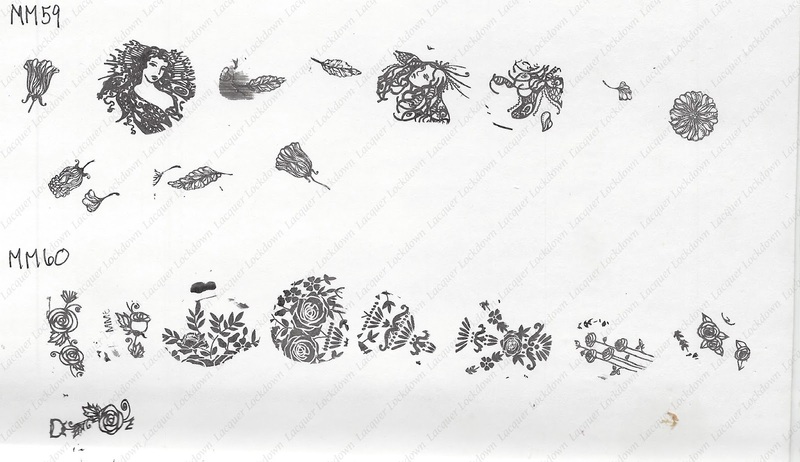 As the company has grown they have added new plates to the MM series, more than 50 in fact, while also creating new additional lines including the Bridal Nail and Leadlight plates you've seen me gush about so frequently. 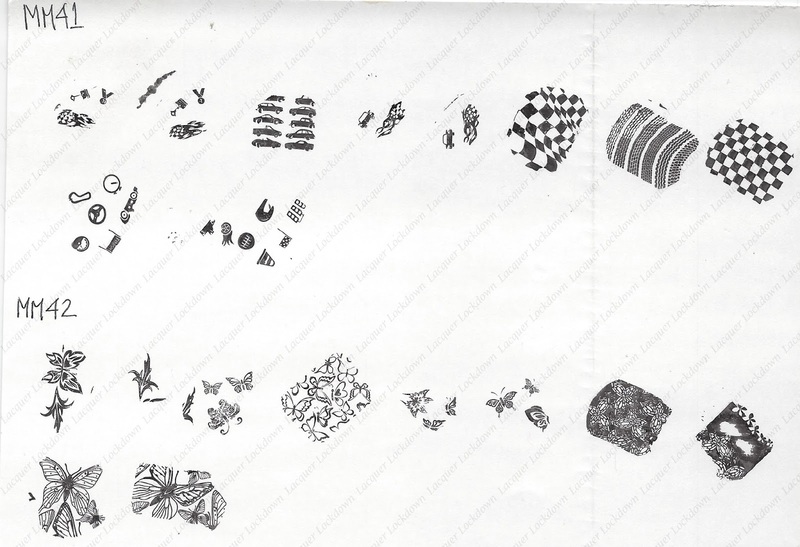 As if this wasn't enough the company went onto to reproduce the the much coveted and discontinued marshmallow stampers, the new accessories kits that offers a unique perspective and tool for stamping and soon a larger and softer stamper than we have ever had access to before. I could go on but then I'd never get to the rest of the review. You'll just have to take my word for it - this company is spectacular! Now let's hop back into the review! 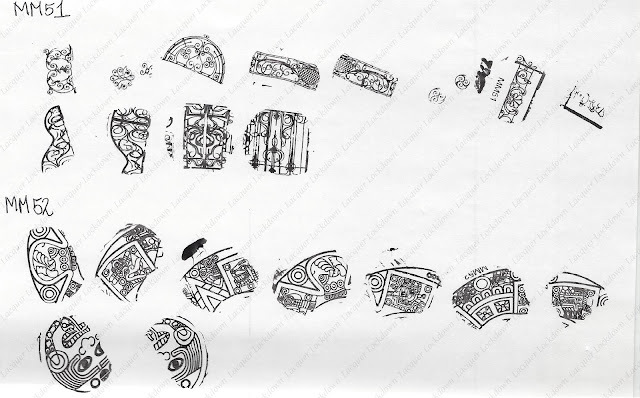 Plates feature between 6-9 full size nail images while accent styled plates s while the plates with smaller accents tend to feature between 12-17 images give or take a few. The plates themselves measure 7.0 cm in diameter. The image size on the MM plates measures 2.3 x 1.8 cm length by width, but they can and do get larger for a few of the images as you can see above. This is one reason why I love the MM plate they are definitely highly friendly to the medium to long nail length crowd. 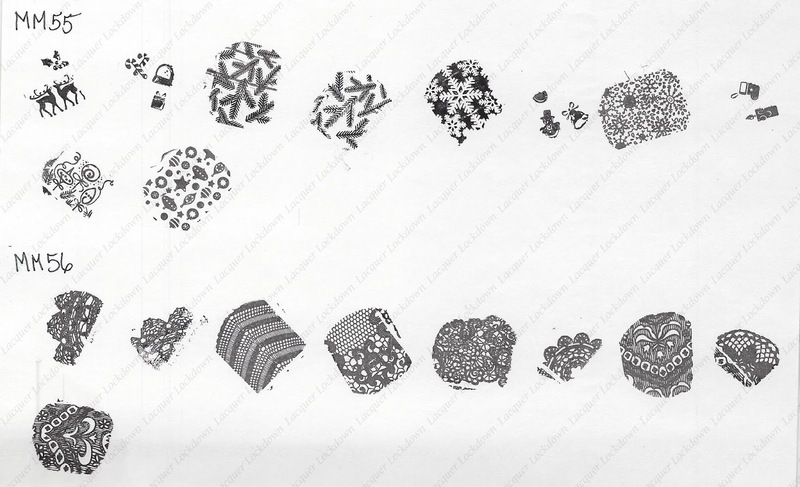 While I listed out a few different brands below you can check out a more complete comparison of the plates on the full sized nail image chart I created. You can view that here. 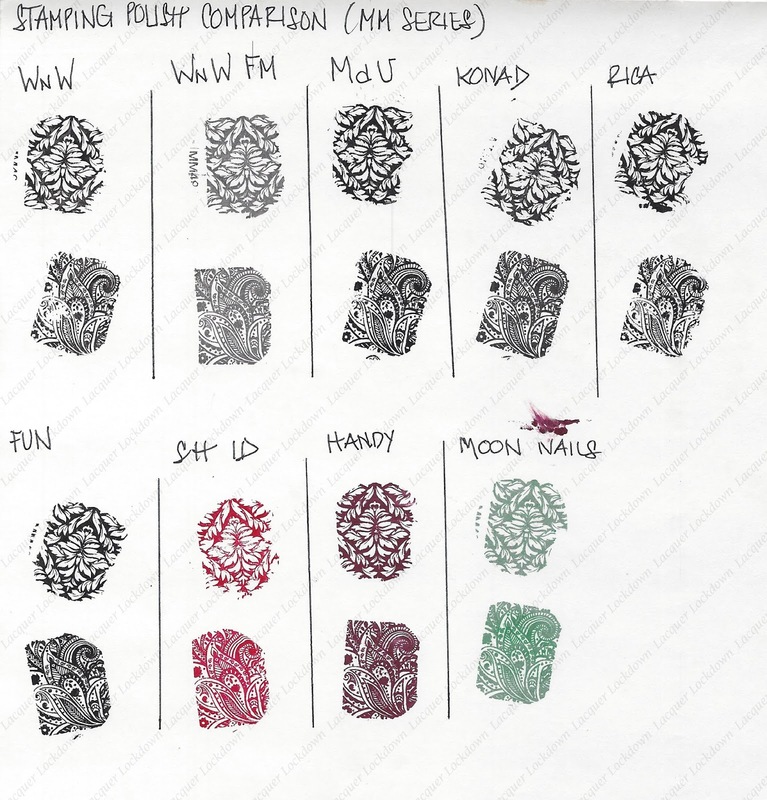 By now if you regularly check out my reviews you know the drill, and if you don't then you will after this ;) I swatch all my images out with basic Wet N' Wild Black Creme and my gold standard XL marshmallow stamper from Bunny Nails (4 years old). When I want to pick up larger images I use my marshmallow stamper from Magno Nails. 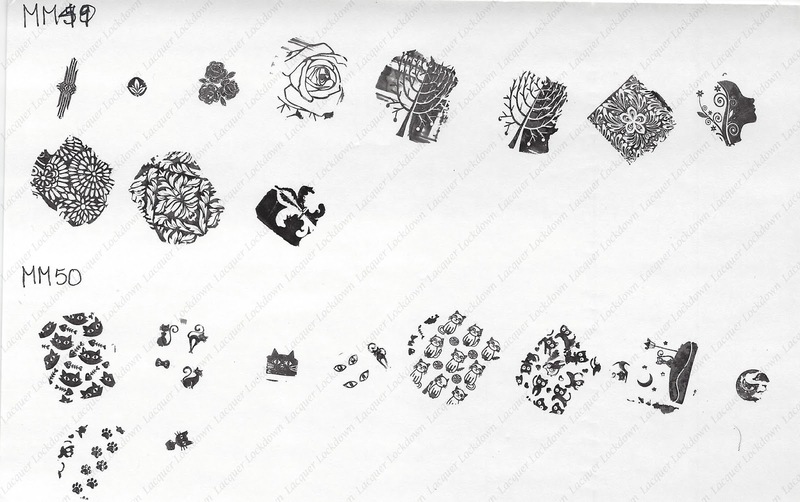 I only switch to Konad Special Stamping polish or Mundo de Unas when I am unable to pick up an image. I did not have that problem once with these plates as the etching was superb. Look at how even fine lines pick up with these plates. Really the quality of Messy Mansion plates is unbelievable! 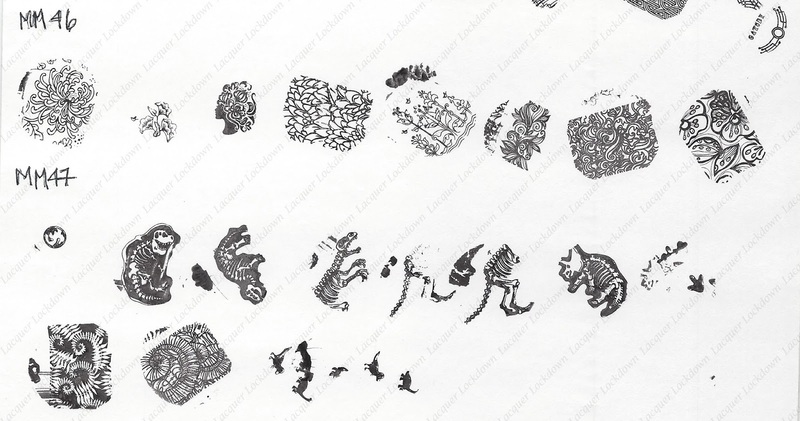 I always end up impressed regardless of the line of plates I'm stamping from. The why of why I use Wet N' Wild Black Creme for my swatches is because it's cheap and readily available. 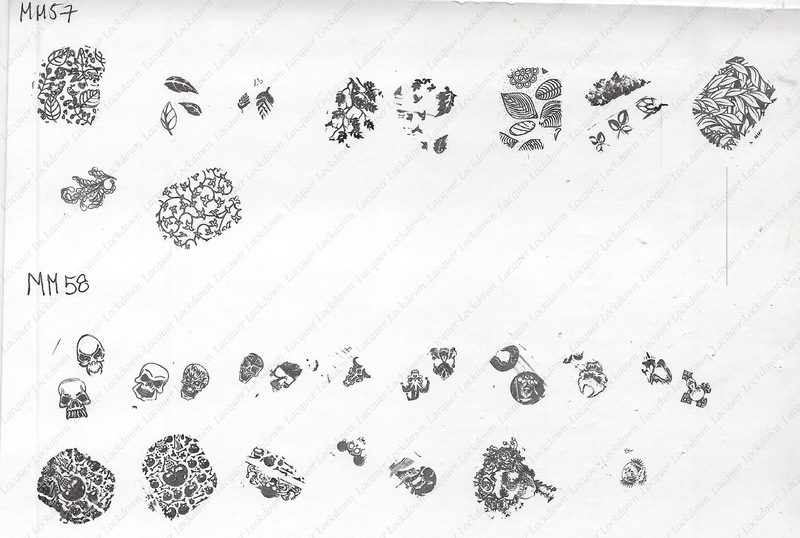 The cheap is a big part when you swatch and review as many plates as I do. It also happens to be the lowest quality polish I can use for stamping. Which means I don't expect images generated by WnW to have the clarity of those generated using a polish made specifically for stamping. Stamping polishes allow an image to stamp with even more clarity and crispness than regular polish. 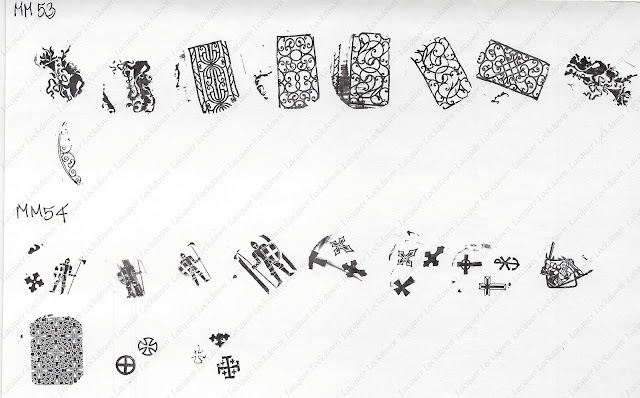 So the bottom line is a plate that stamps well with cheap WnW polish has superb etching because it generates great images even when stamped with a polish not manufactured for that purpose. Btw I absolutely have to stamp with this fairy style plate the minute my nails grow out! I need need to get these images on my nails STAT. 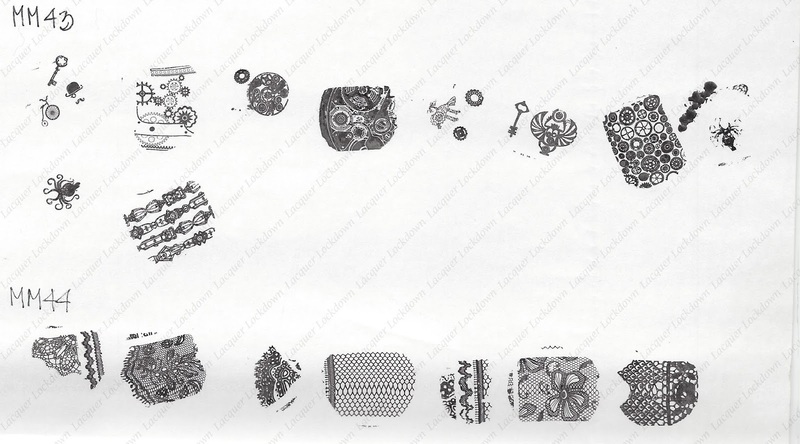 As usual I went ahead and compared several stamping polishes on these plates. For the swatches I've used MM 48 and MM49 which represent images that are both bold and fine. Today I pretty much used the general ones floating around my collection including the cheapies I use for my swatches. If there other stamping polishes or just polishes in general that you'd be interested in seeing swatched let me know. I'm trying to change it up each review so let me know if you have some favorites or brands that you want to see in this line up. So here we are at the end of another epic review Lacquer Lockdown style! Frankly I find myself kind of shocked that I've never reviewed the main line of Messy Mansion plates. Its inconceivable to me because these plates are just so incredibly awesome and incredibly beautiful. I pretty much own all of them except the recent release of 4 new plates. When I first started buying Messy Mansion plates I was in love with the larger image size and the unique one of a kind images offered to stampers. I continued to purchase them because the designs continued to be so refreshing. That's still the case today very much so. These plates are phenomenal and the quality of etching is exceptional. The level of dedication and quality testing that Julia puts into her products is readily apparent. I think most of my followers know I really love this company and so I'm thrilled that despite never doing a review of their main line that when I did they absolutely lived up to all the hype I heap on this company in spades! If you purchase products from this company you will never regret it and if you already have you know that right? I'm definitely a life time fan and advocate of this company. You can find the MM plates on the Messy Mansion website. 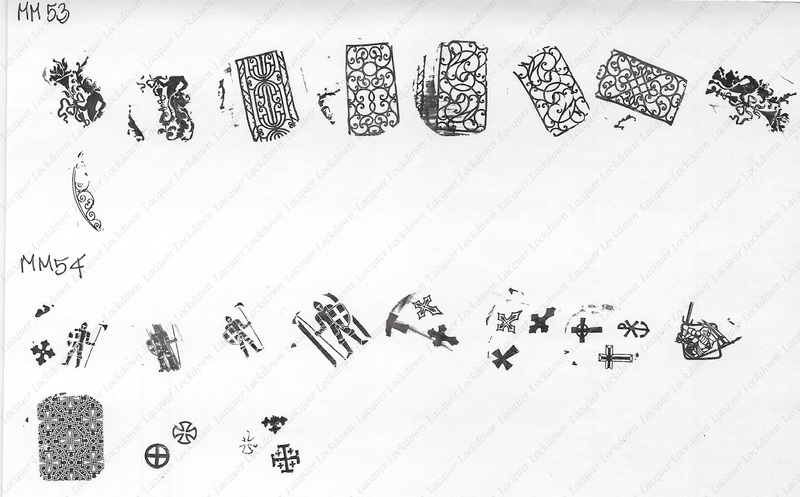 Btw if you haven't already check out their stampers, my favorites are the pink and yellow set, and their other lines particularly the Leadlight Lacquer plates. Again please don't forget to leave me any feedback or questions you might have! Thanks so much for reading and happy hunting!